Most animals need to sleep in some way, shape, or form in order to replenish energy, but how fish sleep is especially fascinating to humans. After all, the fish don’t have beds, they can’t stretch out, they don’t go to a different room for silence, and most don’t even have eyelids! It’s hard to believe they sleep at all, but they do … in their own way. When a fish sleeps, it’s more like a human daydreaming as opposed to fully sleeping. When we daydream, we’re somewhat relaxed and stare off into space, but we’re alert enough to keep ourselves from falling over or walking into an electrical pole. When fish zone out, they’re in a calm state and have a slower metabolism, but they can keep their balance and stay on guard. Fish have different sleeping patterns depending on their breed. Generally, where they spend most of their waking hours in an aquarium is likely where they will remain while they sleep. 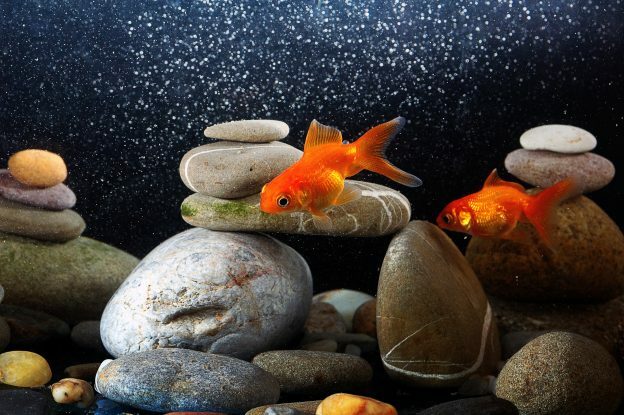 Some fish sleep under rocks, in holes, or in nests they create in the gravel, which is one reason why it’s important to include live or dry rock, real or artificial plants, gravel, and decor in your aquarium. Some fish sleep in the dark, while others sleep in the light, which is why you should install lighting in your aquarium that can be turned on and off. It really depends on their breed and how they would have slept in nature. In the wild, fish that live near coral, for example, tend to stay awake during the day and sleep at night to avoid predators, who likely can’t see as well in the dark. How much fish sleep depends on their breed, age, and what is going on in their world. Some fish are known to sleep all night, while fish that feel endangered will remain alert. A new mother will tend to the young at all hours, and some fish, like tuna, don’t sleep at all. One especially interesting fact, as noted by the National Sleep Foundation’s Sleep.org, is that fish can experience sleep disorders and sleep deprivation. They can experience insomnia specifically, especially if they’re feeling unsafe. When fish don’t get enough sleep, they often won’t function properly, much like humans. Some of the differences in sleep patterns of humans and fish are very obvious, not the least of which is we’d need a floating lounger to be able to sleep in the water. Others, however, are not so clear to see. • Humans experience REM sleep, which, simply told, is when we dream. Fish don’t go into REM sleep, at least not as far as researchers can tell. • When humans sleep, especially in the REM stage, they’re in a mild paralysis. Fish, on the other hand, have to keep moving slightly during their sleep for ventilation of their gills. It’s like our breathing; even though we’re asleep, the respiratory cycle continues. • With the exception of some breeds of sharks, fish don’t have eyelids and therefore sleep with their eyes open. When humans do that, it’s considered a sleep disorder – a phenomenon known as nocturnal lagophthalmos. 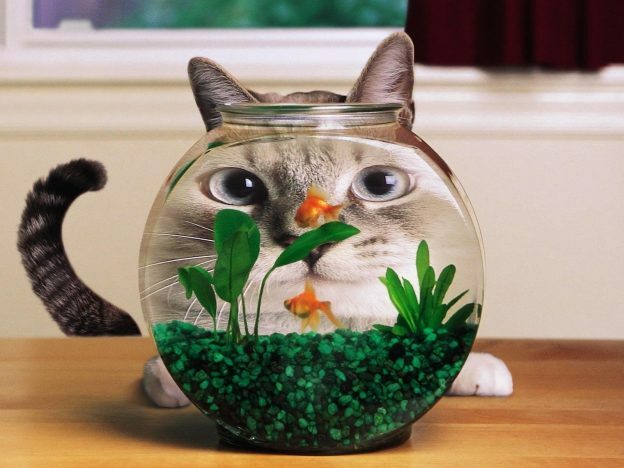 • Newborn fish seem to want to live life to the fullest by seizing every moment of every day. Many won’t even sleep at all until they become adults. This entry was posted in Fish Facts and tagged aquarium fish, Fish Sleep on October 21, 2018 by admin. Aquariums are great creative outlets for you. You can design one small enough to fit into the corner of a room, or large enough to create a room’s focal point. The big decision comes when selecting the type of fish and invertebrates you want. Which means – either saltwater or freshwater. Let’s look at freshwater tanks. Even though ‘beginners’ are told to stay away from saltwater tanks and go with freshwater tanks, it is really up to you and how much time and energy you want to invest into your tank. No matter which tank you decide on, you should be aware of a few tips. All fish start out small, but each one grows at a different rate. So you need to consider which will be better based on your budget as well as the size tank you decide on. It will be more costly if you have to get a larger tank each time your fish develops as well as making sure they have plenty of room to swim in. As everyone knows, goldfish require a container of food that you can just ‘tap’ into the tank, and then off you go. Whereas with saltwater fish, you will need to mimic what they would normally eat in the wild. This means extra types of food and some of those foods need to be refrigerated. If you have children, that is a major consideration in order to avoid them getting ‘into something’ that they should not be into and then get sick. It won’t do your budget any good to buy fish and then come home to find one is dead or half-eaten!! You need to make sure your tank dwellers will be on good terms with each other as well as other fish dwellers in your tank. Some people have tanks in order to breed fish and make some extra cash. So when buying your fish, you need to make sure that they can be bred in ‘captivity’ (i.e. your tank), or that they are not shy around other fish. One last thing to remember – some fish can live for up to ten years in a tank. That means a long-term commitment on your part and has to be something that you are willing to spend time on. So be careful on what fish to want, because it will almost be like a marriage contract! Some of my favorite freshwater fish are Guppies (easy to take care of and feed), Betta (even though they need to be kept away from other fish, they have lovely colors and finnage), and the Oscar (after a while it is said that it will come to know its feeder). Looking at saltwater fish, I like Blue Devils, Clown Fish (like Nemo), and the Forceps Butterfly (its bright yellow color is stunning). Want more information and help deciding on which fish tank is the best? Call Seatech Aquariums. Jimmie and Mike have many years of aquarium experience, and will help you decide on the size, where to put it, and what to put inside of it. Seatech offers a money-back guarantee on its livestock, and will also be there to set up your tank and get you going with regular, first-class maintenance. Visit our website at http://seatechaquariums.com/ or give us a call at 602.628.7270. And if you are interested in getting a Nano Cube Tank, then Seatech is the ultimate expert!! We have several models to select from and again – we will help you get everything you need. Don’t wait – get started today! This entry was posted in Freshwater Aquariums, Industry News and Tips, Saltwater Aquariums and tagged aquarium, aquarium expert, aquarium fish, Aquarium Maintenance, aquarium set up, aquarium setup, aquariums phoenix, coral reef, fish tank, fish tanks, freshwater, Freshwater Aquarium, freshwater fish, freshwater tanks, nano aquarium, nano cube, phoenix aquarium, reef, Reef Aquarium, saltwater, Saltwater Aquarium, saltwater fish, Saltwater Fish Tank, Saltwater Tanks, seatech aquariums on January 20, 2015 by admin.